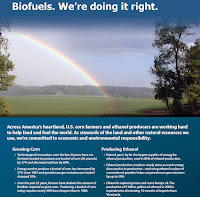 A new campaign by American farmers and supporters of biofuels now includes a full-page ad (pdf) running in Politico, a Capitol Hill newspaper. Technological innovations over the last 20 years have cut the land needed to produce one bushel of corn (56 pounds) by 37 percent and decreased soil loss by 69 percent. Energy used to produce a bushel of corn has decreased by 37 percent since 1987 and greenhouse gas emissions per bushel dropped 30 percent. Over the past 25 years, farmers have slashed the amount of fertilizer required to grow corn. Producing a bushel of corn today requires nearly 40 percent less nitrogen than in 1980. Natural gas is by far the largest supplier of energy for ethanol production, used in 85 percent of ethanol production. Ethanol production results in nearly twice as much energy than used in its production – and using ethanol in place of conventional gasoline helps cut greenhouse gas emissions by up to 59 percent. Ethanol is replacing more and more foreign oil. The production of 9 billion gallons of ethanol in 2008 is equivalent to eliminating 10 months of imports from Venezuela.